On the day of the Mother’s Tea, he told me twice that he was “going to remember this day forever.” That kid is a pro at melting his Momma’s heart! I knew it was a special day for him, so when I was saying goodnight to him and tucking him in that night, I made a point to tell him thank you for the crafts he made me and the songs he sang that day. That story has nothing to do with this granola, but it was too cute not to share. At least I think it was cute, but I’m his mom so I’m more than a little biased. I was going to try to segue into the granola somehow…it’s nut-free so N can eat it! But let’s be honest, that’s a big stretch and I’m not even going to try. But now let’s talk about the recipe! This chocolate chip granola treads the line between dessert and breakfast, but most granola recipes do. 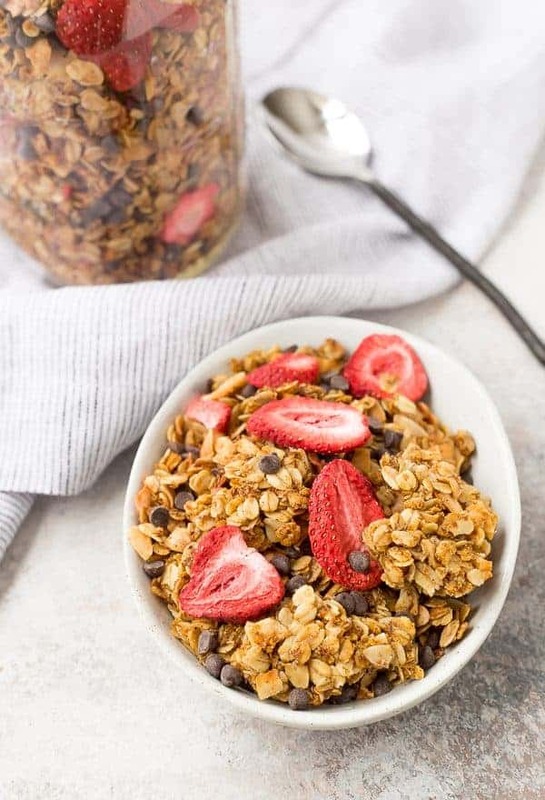 If you’re eating a normal-ish diet, granola isn’t really something you would typically want to fill an entire cereal bowl with. I like granola for a small afternoon snack in a 1/2 cup or so portion, or sprinkled on top of yogurt. If we’re leaning more towards dessert, I love it sprinkled on top of ice cream. This granola in particular, I love to eat with milk. 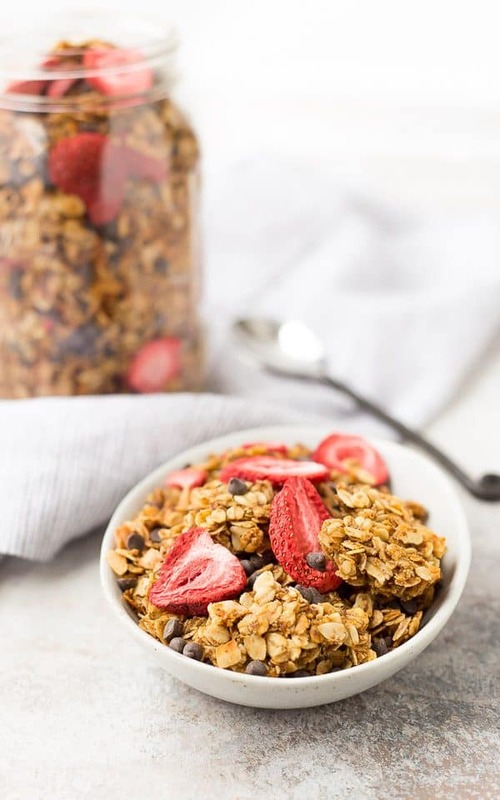 The milk rehydrates the freeze-dried strawberries and they become soft and flavorful which is the perfect complement to the crunchy granola. I flavored this chocolate chip granola with cinnamon (is it even granola without cinnamon? ), cardamom, and coconut. I love the chewy texture the coconut adds to the granola, but if you’re not a fan, feel free to leave it out. 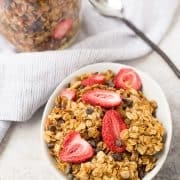 I love the subtle flavor of the cardamom with the strawberries, but if it’s not a spice you keep stocked in your pantry, you’re still going to love this chocolate chip granola without it. Don’t have or don’t like coconut oil? 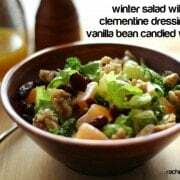 Substitute with canola oil or vegetable oil. Want to make it vegan? Use maple syrup instead of honey and choose vegan chocolate chips. Prefer milk chocolate to semisweet? Use milk chocolate chips! Try a different freeze-dried fruit in place of the strawberries – raspberries, blueberries, or peaches would be terrific! Add some protein and crunch to your granola with nuts or seeds. I love slivered almonds, chopped walnuts, or sunflower seeds in granola. Can’t get enough chocolate? Me neither! Try adding 1/2 cup unsweetened cocoa powder in with the dry ingredients for double the chocolate! Tip: This granola makes a fantastic gift! Place it in a jar, tie on a bow, and you’re good to go! It’s great as a hostess gift or a edible Christmas present. 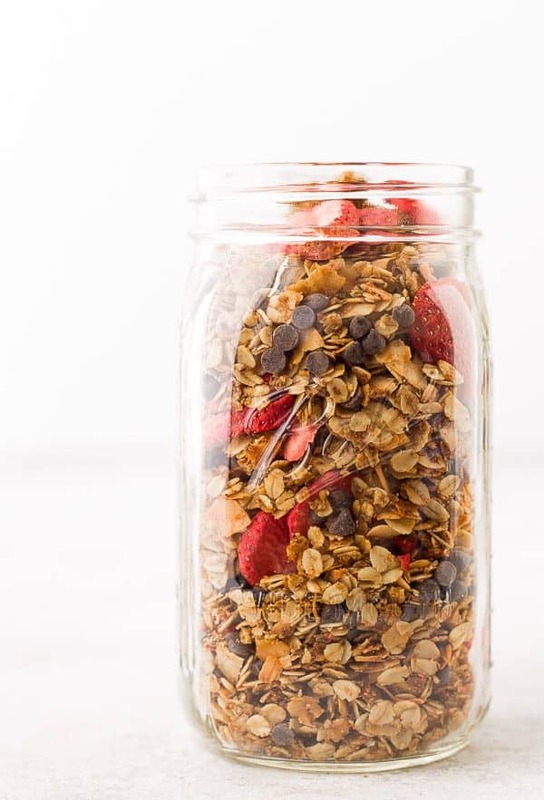 Store granola in an airtight container at room temperature. Make sure to cool completely before covering container to prevent steam from forming inside the container. It will make the granola soggy and it will spoil faster. 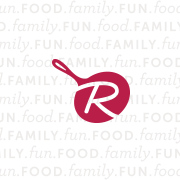 In a large mixing bowl, combine oats, coconut, flaxseed, wheat germ, cinnamon, cardamom and salt. Stir to combine. Place in preheated oven and bake for 15 minutes. Remove from oven, stir, and continue to bake for 15-20 minutes or until golden brown. If you like big chunks, press down with spatula and let cool completely on pan. If you prefer not to have large chunks, stir 3-4 times as granola cools. Stir in strawberries and chocolate once completely cooled. Store in airtight container. 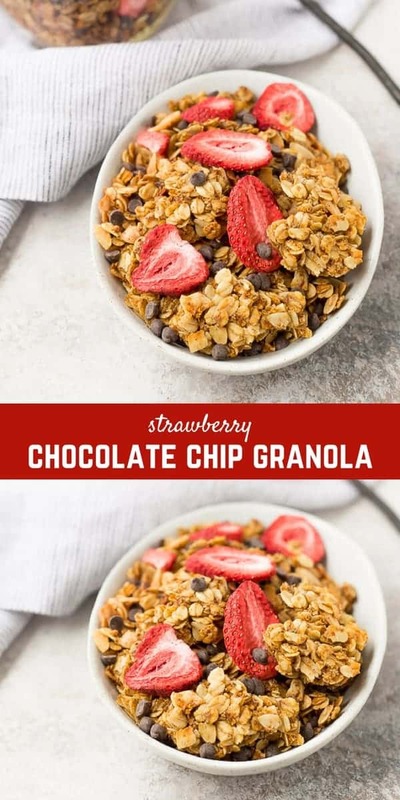 This is in and of itself nut free, but make sure to check labels on your dried strawberries and chocolate to make sure they do not contain nuts. 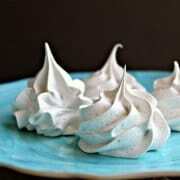 You can leave out the coconut if you’d like – I love the texture it adds! 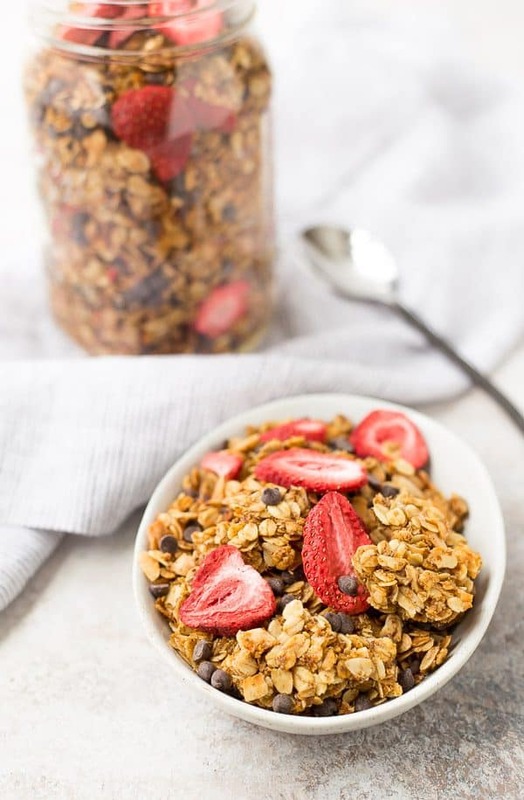 If you choose to add nuts to this granola, make sure to add them before baking so they get toasted and flavorful! Verdict: I love this granola! Usually Ben eats most of the granola when I make it, but I was all over this stuff. Husband’s take: I’m not even sure Ben has tried this! Changes I would make: None are necessary, but have fun with some of the variations I mentioned!